Photograph of Main Street at James Avenue. Shows Arlington Hotel Cafe, Mary’s Cafe, and Seymour Hotel. According to the Winnipeg Free Press, demolition started March 1, 1962. 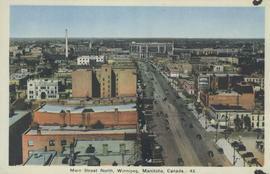 Print shows a photographic image of Main Street looking south from atop the Royal Bank Building. Photograph taken from McLaren Hotel at Rupert and Main Street, looking northeast, probably during World War 1. Date of photograph is uncertain, [between 1912 and 1925]. Postcard shows a view of Main Street from Portage Avenue looking north. Published by Valentine & Sons' Publishing Co., Ltd. Montreal and Toronto. Printed in Great Britain. Date of postcard is uncertain.